The Calixis Sector Hangs in the Balance! The Apostasy Gambit reaches its climax and the conspiracy becomes an open revolt. Now the Acolytes must combat heretical forces from the lowest dregs to the most powerful nobles, but will their efforts be enough to save the Calixis Sector? 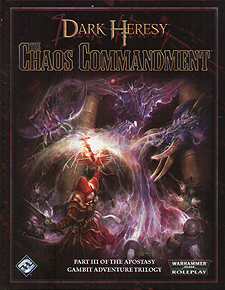 This book is the third chapter of an epic trilogy of Dark Heresy adventures. The Acolytes must fight across the Sector, leading armoured assaults and exterminating daemonic foes as they seek out the true power behind the conspiracy. On the ruins of a once-proud shrine world, the Acolytes face their greatest challenge. Will the Acolytes win this final battle, or will a daemon-possessed Saint corrupt all they have worked so hard to save?